Looking for ways to cut back the cost of a Disney World vacation? Disney World offers more than two dozen official properties, themed for every interest and priced for every wallet. Budget-minded families should consider choosing one of these eight official Disney World resort hotels with the lowest prices. The options include the two least expensive properties in Disney's moderate category, all five hotels in Disney's value category, and Disney's campground. No matter which property you choose, you'll get the same resort benefits as you would at the pricier hotels at Disney World, but at a fraction of the cost. Take a look at the Disney World property map to get a good idea of which resort and its location relative to the theme parks might suit you best. Note that room rates can fluctuate significantly depending on the season, so always check rates across multiple dates. As one of the two least expensive properties in Disney's moderate category, Coronado Springs Resort is a favorite for value-seeking families. The resort's colonial Mexico theming extends to brightly colored casitas and rustic ranchos. 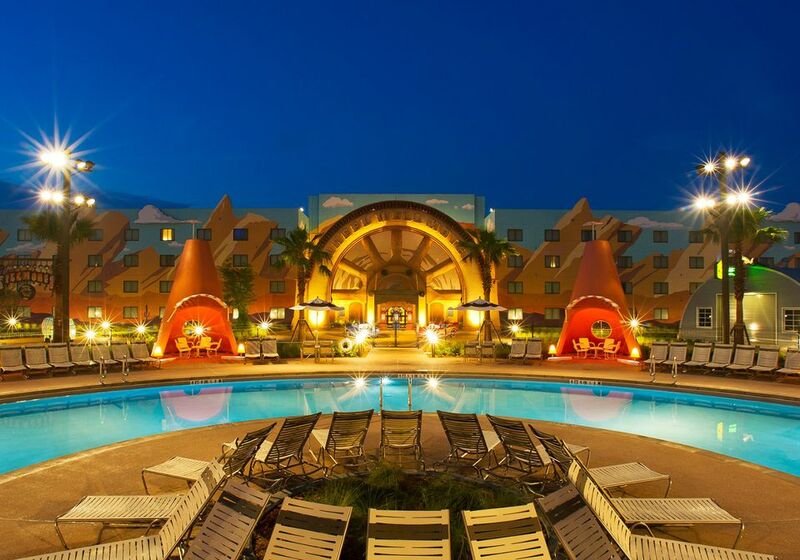 The Dig Site Pool complex is one of Disney World's most impressive waterscapes, featuring a 50-foot replica of a Mayan pyramid, large water slide, and the largest hot tub at any of the Disney resorts with room for 22 people. This hotel is located near Animal Kingdom park and Disney's Blizzard Beach water park. Accommodations are scattered in six clusters of buildings and feature colorful guest rooms and even some pirate-themed rooms. Highlights include a large zero-entry pool featuring a replica Spanish citadel with two slides and water cannons. Bigger kids (and adults) can climb a spiral staircase for a trip down an 82-foot-long slide. Kids under 48 inches tall will love the shipwreck play area with three small slides, and where a barrel periodically dumps its water. This popular resort pays homage to the art of animation by focusing on four beloved Disney and Disney Pixar films from recent years: "Finding Nemo," "Cars," "The Little Mermaid," and "The Lion King." A boon for larger families, the Art of Animation offers 1,120 family suites that sleep six people and 864 standard rooms for families of four. Families get an immersive Disney experience at this resort, thanks to rooms and outdoor features that bring you right into film storylines without sacrificing attention to detail. A big plus is that the main pool of three at this resort is the largest pool of all the Disney resorts throughout the kingdom. The Pop Century Resort is a value-level resort that has a retro feel as it highlights pop culture from the 1950s through the 1990s. That means you can expect to see references to toys through the eras like yo-yos, Play-Doh, and Rubik's Cube dotted throughout the landscape. There are three pools (including one shaped like a bowling pin), a food court, arcade, and nightly outdoor movies. The sprawling Hippy Dippy pool is a nod to the 1960s with flower-shaped jets and a kiddie pool area with a fountain. Two more pools, the smaller 1950s bowling pool, and the 1990s computer pool help you cool down from the sun-drenched Florida days. The magic of movies inspires the 1,920-room All-Star Movies Resort. As a nod to the "Mighty Ducks," there's a hockey rink-themed pool, and Sorcerer Mickey directs a fountain symphony at the Fantasia pool, which features a kiddie area. You can expect to find larger-than-life characters from "Toy Story" and "101 Dalmatians" welcoming you to this resort. The food court at this resort is a crowd pleaser for families, too. As a bonus, this resort offers movies under the stars as a happy ending to the family’s day. Another one of the "all-star" trios, the budget-friendly All-Star Music Resort features inns that are themed to rock, jazz, and calypso music. This resort offers standard rooms and family suites. Family suites include a bedroom with one queen-size bed; a living area with a double-size sleeper sofa; a sleeper chair; a sleeper ottoman; a kitchenette, and 2 bathrooms. There are All-Star Music Resort two themed pools—one in the shape of a guitar, the other a grand piano. The guitar pool is a whimsical heated pool that is home to a fountain of the Three Caballeros—Donald Duck, José Carioca, and Panchito—that spray water as you swim by. For the little ones, there is a separate kiddie pool nearby. Disney’s All-Star Sports Resort features 1,920 value-priced rooms in buildings festooned with larger-than-life sports icons representing surfing, basketball, tennis, baseball, and football. Giant-sized surfboards line a sprawling pool area. For the little ones, a kiddie pool is located nearby. A second pool, the Grand Slam Pool, is shaped like a baseball diamond that features a Goofy fountain that squirts water at swimmers. After the day is done, you can watch a Disney movie outdoors on the football field inner courtyard. There's a playground for children in the Touchdown! area and an arcade room with video games and pinball near the Stadium Hall. Enjoy the outdoors but not into tent camping? The Fort Wilderness Resort offers more than 400 cabins nestled among towering pines and native cypress trees. Cabins sleep six and offer many of the comforts of home like a refrigerator, stovetop, dishwasher, microwave, toaster, coffee maker, and free wifi. If you have an RV, this is the place where you want to plug-in and relax or get going to the theme parks. The resort features a pool plus lake activities such as fishing and canoeing. Every night, the resort features an Electrical Water Pageant with giant, spectacularly lit sea creatures cruising the lagoon to Disney tunes.